Fans of professional basketball are used to watching and following teams from larger cities like New York, Los Angeles and Chicago. Some smaller but still significant cities like Salt Lake City and Portland also host teams. But in the early days of the league, there were teams in much smaller towns like Anderson, Indiana; Sheboygan, Wisconsin; and Waterloo, Iowa. The team from the last city on that list is the subject of this excellent book by Tim Harwood. The Waterloo Hawks were formed in 1948 when the National Basketball League (NBL) was looking for a new city in which to place a team and northeastern Iowa was a site considered because of the success of the minor league baseball team affiliated with the Chicago White Sox. The Hawks had some success on the court in the NBL and also were a moderately successful attraction at the gate as well. Before the 1949-50 season, the NBL and the Basketball Association of America (BAA) agreed upon a merger of the two leagues instead of competing for players and fans. The new league was called the National Basketball Association (NBA) and formed one 18-team league that included Waterloo. That 1949-50 season makes for some very interesting reading. Not only does Harwood recap the season with some good game recaps, but he also shares stories about some of the players and other personnel of the team such as Leo Kubiak, Paul “Pinkie” George and Harry Boykoff, who was considered Waterloo’s best player. One very interesting fact was that even though the Hawks finished with a losing season and missed the playoffs, they won the last game on the last shot in the last second of that season. That 1949-50 season turned out to be the only season in the NBA for Waterloo and three other clubs from smaller cities, including the aforementioned Anderson and Sheboygan. Despite the solid support from fans and businesses in Waterloo and Sheboygan, and the latter’s record of success on the court from previous leagues, the NBA decided to not allow those four teams to participate in the league for the 1950-51 season, bowing to political pressure from the bigger cities. Reading about this struggle by the team to play another season, along with many other stories of the business side of the game during the early days of professional basketball was the best aspect of the book. Harwood did excellent and thorough research and the writing style was very easy to read. I wish to thank University of Iowa Press for providing a copy of the book via NetGalley in exchange for an honest review. This was such a fun book about the start of the NBA. It is easy to forget the NBA and NFL started in towns that now they only fly over. Iowa had one of the first NBA teams, i don't care much about basketball since the Monarchs folded so the detailed writing on some of the games i only glanced at, but the history was enjoyable. Harwood made me care about the towns, the league and the people involved. Wish i could have said i was at one of the games. 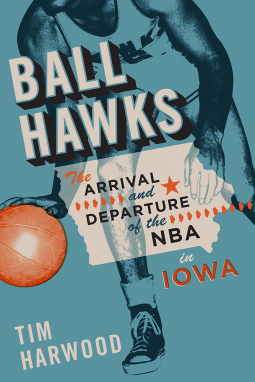 Harwood did the Iowa community and the NBA a favor by writing this book.